Copyright song is so so awesome! oh don't worry. the full length album will happen. it's just that it looks like it's probably going to get pushed. i just read on allkpop that even jinusean is making a comeback soon. this makes me wonder if even 1tym might make a comeback. although i'm happy for all the old school yg artists and all, as a lucky 7 this also makes me more and more concerned for se7en's album. i want se7en to promote his full length album for a long time and during a time when no other yg artists are promoting and with his japanese promotions already planned for the next year, will he be able to fully promote a full length album before the end of the year? but i mean, i guess on the bright side at least he is making appearances and promoting his mini album for a pretty long time. i hope though that his follow up song won't get too overshadowed by 2ne1's comeback. JUS MET VANNESS!!! ITS BEEN 4YEARS!!! GOOD TO SEEN YA BRUH!! GOD SPEED!!! HOLLA!!! Good to see @officialseven after to many years! Keep rockin bro~! oooh. off to go watch strong heart right now. here's the link to se7en singing i need a girl for those who want a little preview of his appearance. For me, I want the kind of songs that he has in his past albums - ballads, R&B, hip-hop.. and the throw some up-beat songs.. just like the songs in the DB mini-album .. i want varieties.. not just one particular genre.. also, I want some collaboration or duets in the album too.. maybe they could talk to BOA.. kekeke.. they're like close.. i always read their replies on twitter... Park Bom or CL .. GUMMY! .. Daesung .. and other artists.. lolx..
same same. it's really sad for me to see se7en working so hard on his promotions by making all these appearances and all but to have his cafe fan numbers continuing to drop. i've decided to just enjoy his mini album promotions and accept them for what they are but i would be lying if i said i didn't have really high hopes for his full length album. se7en isn't exactly getting very good feedback in korea right now so i want him to do really well and shut all those haters up. anyways, about the strong heart episode. i really liked it!!!! but i wasn't very interested in the non-se7en parts. based on the preview for next week it looks like he'll be talking about some battle between him and rain before his debut. a lot of people suspect it's the one that jyp talked about on family outing a while ago. anways, looking forward to happy together and next week's strong heart! oh and chocolate too! 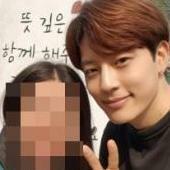 based on the pictures on cecilia's blog it looks like se7en did a couple game with comedian park ji sun. it says in the picture of se7en doing a dance battle with actor lee han that there is a really big twist. on first impression this made me think that se7en probably lost the dance battle since most people would expect him to win. hopefully not. i want to see se7en rock his amazing dances and show why he's one of the best dancers out there! hello! this is my first post here i think hope i can be part of se7en's lucky 7's fans it's only last year that i was exposed to kpop music and i love yg family...se7en, 2ne1 and bigbang...love them all!! thank you for sharing your posts regarding se7en, his twitter, pics, vidlinks...really appreciate it! *** Thanks for posting the photos. I admire him for being so transparent of his feelings towards PHB. In fact, in the episode of Strong Heart Se7en shared the very moment when he first met Park Han Byul. “I met her when I was in 8th grade of junior high. While I was heading over to the YG Entertainment building, I spotted a girl practicing some dance moves while wearing athletic wear. Upon looking at this girl with straight black hair, it was love at first sight. I still remember how she looked like at that exact moment. She was giving off a glow.” Up to now, their relationship is still standing strong. Se7en also revealed the reason why he decided to announce his relationship with Park Han Byul: “Things got a little out of hand with the scandal (from the photos), and it troubled Park Han Byul. Every night, when I talked with her on the phone, she would start crying. There really wasn’t anything that I could do since I was in the states during that time. After I finally announced our relationship, Park Han Byul and I feel more comfortable”. This couple is just so cute together. It’s a role model couple for celebrities. 8-years is very long - that’s awesome! But I’m glad he announced it. I wish them happiness forever! I hope other celebrities can date openly like this. Celebrities are human too! I won’t be surprised if they get married few years from now. After 3 years and 8 months, finally Se7en has come back and he recently revealed that he got tips about how to behave on variety shows from SeungRi. On the August 31 episode of Strong Heart, Se7en revealed that SeungRi gave him the advice on what to do on variety shows. When Se7en first debuted as singer, Big Bang members were only trainees at YG. However during his hiatus in Korean music industry, Big Bang became the new idol group and gaineda lot of popularity. During the show the MC asked whether Se7en miss the variety shows or music shows in Korea. He said he missed it every day. He usually watched the shows when he couldn't sleep. Then the MC continued asking if didn't he get tired from all the activities he did in United States. Se7en answered "it's not as much as you think" which created much laughter from the audiences. Se7en also said that he is very happy that Big Bang has become a famous idol group. He continued that now he even got advice from a Big Bangmember. Se7en continued that before he came to the show he sent SeungRi a message said "Help me. What should I do?" SeungRi messaged him back and said "Just relax that's all"
On a recent survey, from Korean Tweeters they have chosen the Korean Celebrities on Twitter with the most influence and power. Their category for the chosing the top personality depends not only the number of followers, but also number of lists, retweets and mentions for the account. Beating other idol group members on the top spot is no other than, Super Junior’s Donghae. Do you agree with the list or not? In the twitter world, there are many celebrities and politicians existing, and these people generally have a huge number of followers ranging between few thousands to few millions, and they could usually confirm this with the click of a mouse. For now, there are a few sites that release twitter ranking based on number of followers. However, despite having a huge number of followers, it is the most important of how much your followers actually respond to your tweets that’s crucial. www.koreantweeters.com has recently carried out a service titled Power Tweeter List as they choose the Top 50 most influential and powerful tweeters. These most influential tweeters not just consist of number of followers but also the number of lists they are in, number of re-tweets, and number of mentions of that account etc, and the results are as follow. need to make time to watch se7en's kangshimjang episode! OMGGGG!!!! FOLLOW UP TRACK IS I'M GOING CRAZY!!!!! I COULD DIE HAPPILY RIGHT NOW. Is it possible to die twice?! There is just so much good news!!!! Passion AND La La La?!?! And I'm Going Crazy to top it off? I actually feel like screaming with happiness right now! !